Most children love pizza and first thing come to their mind if ask them “what’s for dinner”, is Pizza! They would be extremely happy to enjoy the dinner that evening. However, eating too much or too often might bring opposite spectrum of joy, the worries on health. Pizza is kinda fast food, and most of the pizza are very high in salt and fat. I often felt very thirsty after a pizza meal purchased from the pizzeria. Pizza is an oven-baked, flat, generally round bread that is usually covered with tomatoes or a tomato-based sauce and often mozzarella cheese, with other toppings added according to region, culture or personal preference. In order to eat pizza more healthily, easily available, and to satisfy kid’s craving for it. I made my own version of pizza, the pizza bread. The easiest way to make it without hassle of making the dough for pizza crust, I used bread. So, I called it pizza bread. (I’ll show you the actual method of pizza-making next time, mostly over weekend). This recipe is simple. If you are making it for your children to bring to morning school (or for yourself to work) in rush hour, prepare the topping ingredients the night before. Just place the toppings on the bread and bake it in the morning. The processes of placing toppings and baking the pizza bread take only 20 min to complete. 1) Preheat oven to 150 ℃. 2) Spread butter lightly on the bread, followed by tomato sauce. 3) Cut your bread to desired size or patterns. 4) Place toppings covering whole bread. You may try this sequence: mushroom slices, diced tomato, ham pieces, and sprinkle some black pepper. 5) Lastly, top the mozzarella cheese strips. Repeat steps for 3 more slices. 6) Place a sheet of aluminium foil on the baking dish. Lightly grease foil with a layer of butter. 7) Transfer the pizza bread on the baking dish, bake for 15 minutes, or until crisp and cheese completely melted. Serve warm. ‘Flood‘ the bread and no worries about overflowing with toppings, the baking process will ‘stick’ all ingredients together with the cheese, and stay on the bread without falling out, after baked. If you are not eating it warmed and immediately, this pizza bread tastes good, still. Just expect a little softer than the warm bread. However, the overall taste is still palatable, even placed after a while. Hence, it is also good to make as party dish. Looks cute and presentable with the bite-sizes. Homemade pizza bread is healthy, less salty and easy! 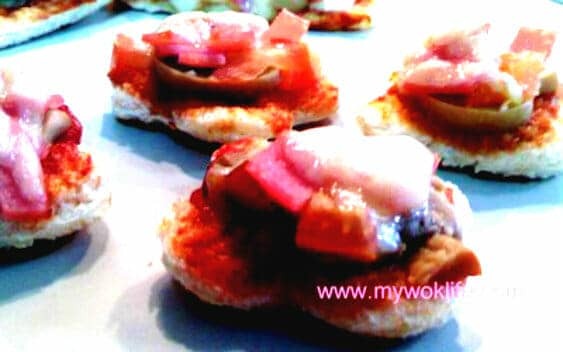 Calorie of a slice of pizza bread with this recipe counts 120kcal which considered as low, as compared to the pizza from pizzeria which counts about 250kcal. Just to let you know that this bite-sized pizza bread is less than 50kcal. Tips: If you are on diet and wish to try this, choose light (low-fat) bread, and low-fat Mozzarella cheese which is available at most of the supermarket. Give up the butter spreading, too. The rest of the ingredients such as tomato, ham and mushrooms are perfectly alright for dieting. It will save you about 30kcal per serving of 1 slice. *You may use pasta sauce (tomato flavour) instead of usual tomato sauce. Homemade pasta/ pizza sauce recipe here. 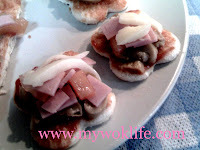 *Get the pre-sliced button mushrooms in can, to save your time and effort on slicing.